The first Great Nature deck only contained 12~16 Great Nature cards, because that's all the clan had. Your main grade 3 was Mr. Invincible, and your goal was to get Scientist Monkey Rue on your rearguard circles, using his counterblast to buff up and then kill the Silver Wolves and/or Intelli-Mouses behind him each turn. Normally that would cost a total 4 counterblast, but with Mr. Invincible and Dogu Mechanic letting you countercharge each turn, it was reduced to effectively CB1 for +4000 to a unit. In the Onslaught of Dragon Souls format, when anything over 16k was remarkable and most vanguards were 10k bases (and some were 9k) having consistent 20~22k rearguard lanes was something special. You could substitute one of the Scientist Monkeys for a Geograph Giant, get backup countercharging from Hungry Dumpty and Super Electromagnetic Lifeform Storm, and if the game dragged on long enough you might even use Invincible's megablast late-game to stand the whole field. 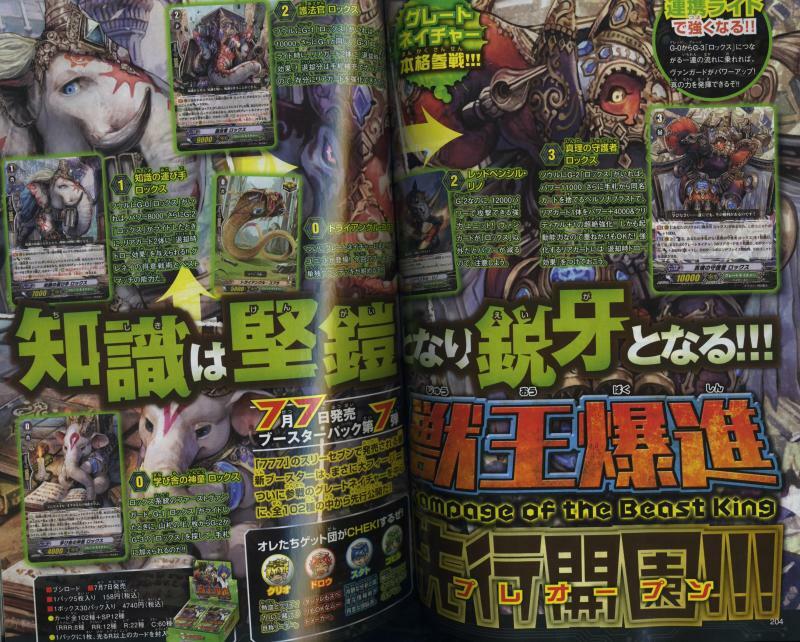 That day came thirteen months later for the Japanese format, when BT07: Rampage of the Beast King arrived on July 12th, 2012. 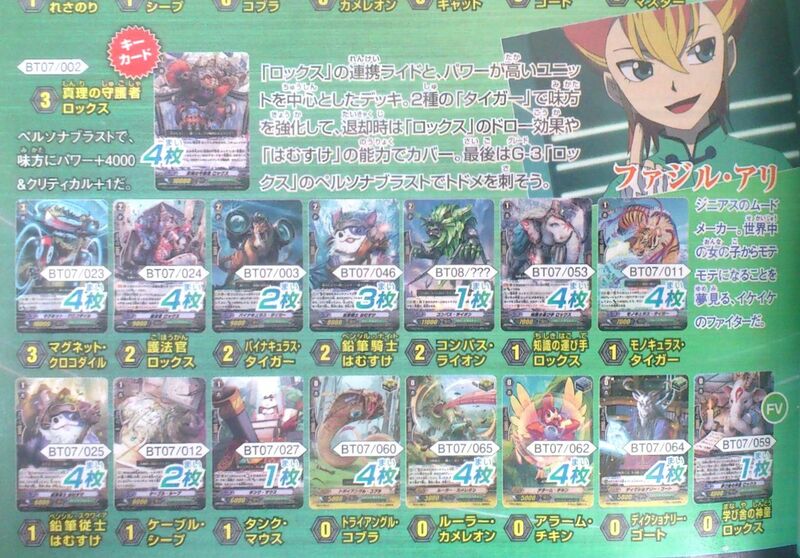 Or for those of us playing with KeroKero Ace leaks on Cardfight Capital, May 25th. Without further information the deck wasn't fully playable on these alone, as it was missing a fourth trigger type. Some fighters either proxied a draw (presuming a rainbow trigger set would be the only one possible) or mixed clans to fill out the deck. Initial observations of the deck showed a pretty clear divide between Lox and Apt usage. 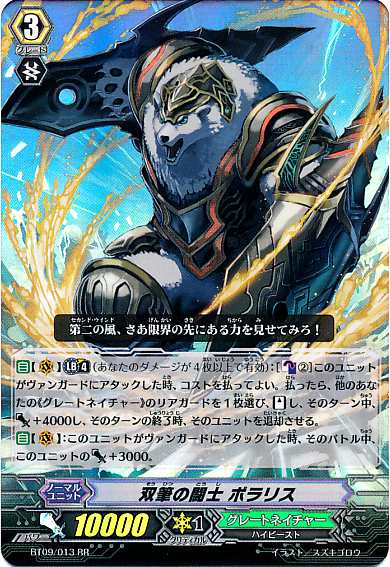 Apt should have been the clan's go-to boss card, like the other Garmore clones of his day; prior to Spectral Duke hitting, Great Silver Wolf singlehandedly made Gold Paladin the beast it was in the English format. In a pre-Shamsiel world Kiriel was the core of the best Angel Feather decks, while Cocytus gave Granblue its first moment in the spotlight since the clan's inception. Tamamo, Battle Sister Cookie, and Raqiel would all go on to be fleeting darlings for their respective clans. So why did Apt specifically fall flat? While this wasn't immediately obvious, Great Nature's own core abilities made the Garmore method obsolete. Like all Garmore clones Apt had a Charjgal equivalent that could boost him for a sum 11000 power, Feather Penguin. The problem being, there was no reason to run a base 6000 11k soulblast booster when you could achieve the same effect by throwing 4k on any of the clan's cornucopia of 7ks. It was cheaper to do it, and it kept a cycle of on-retire draw effects going. So even if you were playing Apt in your deck, there wasn't much incentive to build specifically around his one named support card. AUTO [Vanguard Circle]: [Choose one of your <<Great Natur>>" rear-guards, and retire it] When this unit 's attack hits a vanguard, you may pay the cost. If you do, choose up to one <<Great Nature>> from your hand, and call it to Rear-guard Circle. Second, rather than a superior call for advantage like other Garmoes, his normal skill was instead supposed to be for Great Nature what Sword Magician Sarah was for Pale Moon. But Sarah had Purple Trapezist to work with to let her get an entire column to stand while Apt had to rely on stand triggers for the same effect. And because his retires took place in the battle phase rather than the end phase, none of the clan's on-retire skills would resolve. Where the card shined was in retiring units that were already consigned to die from receiving previous power buffs, replacing them Skydiver-style with new attackers. Apt would turn out to be a passable backup grade 3 when BT07 launched, but was quickly outmoded by the time BT08 rolled around. On the other end, you had Guardian of Truth Lox. This was a card many cardfighters mistook for an advantage engine, then became frustrated with when it turned out they weren't drawing all that many cards compared to Oracle Think Tank or even Gold Paladin. The Lox ride chain was part of the same second-generation wave of chains kicked off by EB02's Riviere then succeeded by BT06's Ergodiel, but it had more in common with the latter than the former. To recap, the difference between Ergodiel and Riviere was that each individual step of riding a piece of the Ergodiel chain (Heavenly Injector --> Fate Healer Ergodiel --> Cosmo Healer Ergodiel) resulted in a net wash in terms of card advantage, putting two cards into the damage zone to bring two cards out. What this was supposed to do was play off of having Million Ray and Thousand Ray Pegasus columns in play beforehand, creating aggressive 24k-power rearguard lanes early in the game. The problem was that it flopped if you didn't have the existing setup in your opening hand, whereas decks not built around these strategies could devote space to things like Gojo and Aermo clones for the purposes of fixing bad early hands. 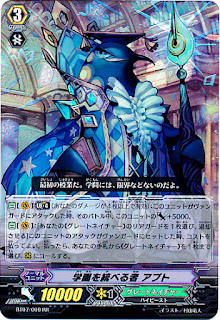 Meanwhile Riviere instead drew a card with every ride (Top Idol Riviere --> Super Idol Riviere --> Eternal Idol Riviere) resulting in a net +1 each turn instead of a neutral +0. In theory the rides from Ergodiel when executed well could take away far more cards from the opponent than you would gain from another ride chain, but in practice it was so dependent on getting specific cards in play early in the game that it rarely worked out to be better than Riviere or Vortimer's take. On paper, Lox looked like he could give card advantage. With every ride (Bringer of Knowledge Lox --> Law Official Lox --> Guardian of Truth Lox) he would endow two rearguards with the ability to draw 1 when they were retired during the end phase of the turn. The problem with this is that by default, Great Nature's retire skills did not already draw to replace the units they retired; the units gained a 4k buff then died in the end phase with no immediate recouping of the lost cards. So these skills simply made those power gains a neutral exchange that could potentially cycle out bad cards, but were ultimately a wash. The only way to actually plus off of these retires in BT07 was with the Hammsuke series, and to maximize your chance of getting one in hand during the grade 1 and 2 turns you needed to run each of them at 4, when the ride chain was already taking up 4 slots per grade. It was only with the release of Coiling Duckbill (a grade 1 that applies a Lox effect to any other rearguard) in BT08 that Lox could finally plus off of his retires without committing all of his slots, and by then there were other Great Nature decks doing it better and more consistently. Lox had a lot of issues preventing his spread--he needed a very specific setup to work well, he needed it early, and it had to come in the form of both units that could be targeted for advantage (Hammsuke) and units that could retire them to trigger the skills. (Binoculus and Monoculus) Moreover, by being a ride chain the deck necessitated losing a huge amount of space that could have gone to other utility cards like Hula Hoop Capybara or Flamingo. What Lox did have going for him was his persona blast. This was not a limit break like the other Great Nature boss cards, but a BT05-style persona blast where you paid counterblast 2 in the main phase and discarded a copy of Guardian of Truth to give one unit +4000 power and +1 Critical. 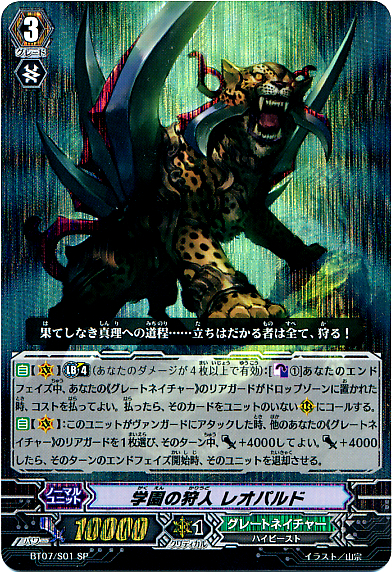 A Magnet Crocodile (generic 12k grade 3 attacker) given his persona blast and buffed by Binoculus Tiger could be terrifying provided you checked a stand trigger. 20k 2 crit rearguard attacking twice was far more intimidating than a 21k 2 crit center lane, because you had to account for both vanguard and rearguard attacks being capable of ending you in the same turn. Stands in particular were recognized as better in Great Nature than in other clans from the moment we first saw Binoculus Tiger in mid-June. The deck lived and died by Binoculus' ability to give a Monkey Rue effect to a rearguard every time it attacked a vanguard. What this did was essentially make stand triggers into an early version of front triggers, giving 9k power instead of 5k. You would attack with Binoculus first and give 4k to your other attacker, then if you drive checked a stand with the vanguard you would stand Binoculus but give the power to the attacker. Binoculus would swing at the vanguard and not be able to hit, but could still give another 4k to pump that attacker up further. Stands also opened up plays like giving power to the vanguard on a two-to-pass battle and still getting 4k on a rearguard through Binoculus as a safeguard in the event a second trigger didn't come out, which was more often then not enough to bump up the final guard value. 6-8 stand quickly became common to the deck. All this brings us to an issue in game design. Gold Paladin, for CB2 SB1 off of Garmore --> Dindrane in the same set would get a net +2 on-ride. Great Nature, for CB2 persona blast and CB1 Hammsuke search would get a net +0. Lox involved way too many unstable moving parts to justify his use, which was disappointing considering he was the cover card of the set. It was like BT02 and 04 all over again. Lox was complicated and lacked a real payout to all of that searching, drawing, and persona blasting. He had a good finishing move, but none of the technical payoff his ride chain seemingly foreshadowed. Meanwhile Apt was very simple yet lacked synergy with the deck's rearguard support. There was a serious argument to be made for playing School Backpack Sealion instead. (Crimson Butterfly Brigitte clone, for you youngsters.) Where could Great Nature possibly go from here? We knew of one last boss card from the moment the set's sleeves were revealed: School Hunter Leo-pald. The contemporary wave of Card of the Day profiles spent a lot of time reiterating the things we had already learned about in KeroKero Ace, mainly Apt, Lox, and the Hammsuke line. The real turning point was when the ongoing Asia Circuit anime finally revealed Leo-pald's limit break in late June. 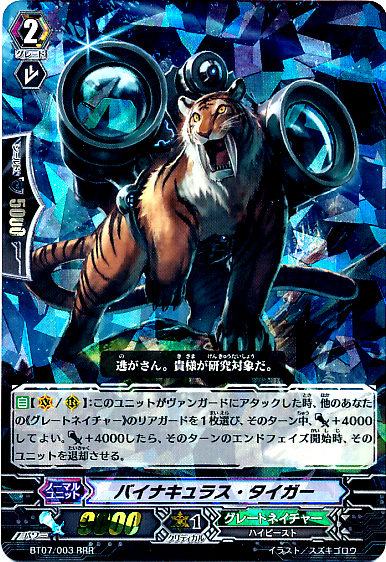 On vanguard circle, it was a grade 3 continuation of Monoculus and Binoculus Tiger, buffing a rearguard by 4k on-attack and retiring it in the end phase. As for the limit break, when a unit was retired in the end phase, he could pay counterblast 1 to bring it back to the field. This was nutty. One turn you could retire a Hammsuke, fetch a copy of it, bring the first one back, then the next turn get Binoculus and Leo-pald's skills going on both Hamms to grab the rest of the playset. Net +1 for CB2, and with Tick Tock Flamingo thrown on the Hammsuke it'd be as low as CB1. Once BT08 hit--and we had access to Duckbill well before that, mind, as this was on CFC--you could draw 2 off of the Hammsuke on top of that, a net +3 for CB1. Leo-pald put the Great in Great Nature, and the only issue with the deck was the lack of a good alternate grade 3. Most cardfighters were running Magnet Crocodile, as it was a 16k by itself when buffed and could help out versus crossride decks, but there weren't great options for the vanguard circle itself. Lox cost too much counterblast and his persona blast was overly restrictive in a deck that needed the skill to get the retire and draw effects going, while Apt was just a vanilla 21~26k column. Whether that was really a step up from the Brigitte-and-Alfred days was uncertain, and a few cardfighters seriously ran Sealion with Leo-pald because of that. 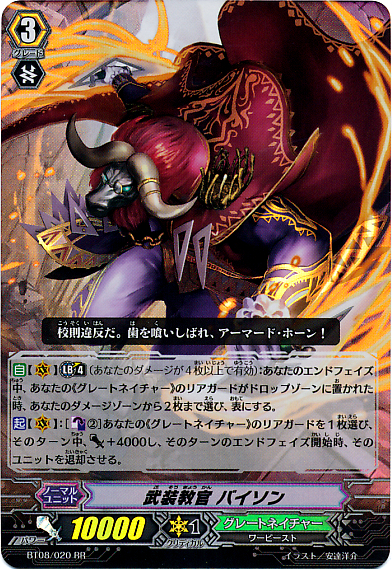 Leo-pald did found a potential partner and competitor in BT08, in the form of Armed Instructor Bison. Bison had a similarly-timed end phase LB4 that countercharged 2 every time a rearguard was put into the drop zone. Essentially Bison was the Flamingo to Leo-pald's Duckbill, enabling the entire Hammsuke line. BT08 was also where we gained Compass Lion, the clan's 11k grade 2. While most 11k grade 2s in this era possessed Restraint, Lion instead required a rearguard to be retired in the end phase (compare and contrast Cannon Gear from Tachikaze.) Compass Lion was an invaluale asset, as he could be an effective backup for Binoculus. This limit break was an incredible temptation, and a predecessor to Tri-stinger Dragon in BT09. You could use it in a more straightforward form, going CB4 to power up two rearguards for an aggressive offensive, then countercharging all of that damage in the end phase and ideally using replacement skills with Duckbill to gain card advantage. Or you could use it as a fuel for bigger costs, like the Bison decks that ran original Dragonic Overlord for his CB3 restand ability, making up for his loss of -2000 power by putting buffs onto his boosters. Being a functional CB1 for a 14k rearguard that could clear out the opponent's front row units made Overlord a powerful niche choice over running Bison with Leo-pald early in the deck's life. With the coming of BT09: Clash of the Nights and Dragons Bison fully branched out into a separate deck build, using Vocal Chicken, Melodica Cat, and Recorder Dog in combination with Duckbills to simultaneously gain card advantage, maintain strong columns, and thin the deck of non-trigger units. To summarize it succintly, each card in the series searched for the next; so when the grade 3 Chicken was retired it would superior call the grade 2 Cat from the deck, and when the Cat was retired it would search the grade 1 Dog, after which it reset so that the Dog searched for the Chicken. Leo-pald could use these cards too and gain instant advantage off of them with no Duckbills required, retiring the units to superior call the next in line and then revive them. A single Melodica Cat over the course of two turns could be transformed into a Melodica Cat, two Recorder Dogs, and a Vocal Chicken, provided you had a Tiger or Lion to help get the party started. 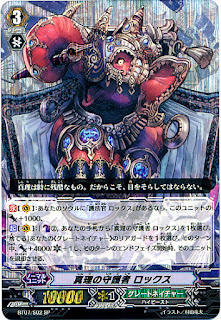 AUTO [Vanguard Circle]: [Limit Break 4]: [Counterblast 2] When this unit attacks a vanguard, you may pay the cost. If you do, choose one of your other <<Great Nature>> rear-guards, Stand it, during this turn, it gets Power +4000, and during the end phase of hte turn, retire that unit. In some respects Polaris was like an inversion of Lox. Rather than giving a unit crit and driving for a stand trigger to close the game, Polaris was giving the unit stand and driving for a crit. This conformed more to what we expected of conventional Vanguard play and trigger lineups, and Polaris as a whole was a lot easier to "get" as opposed to Bison's convoluted Vocal Chicken setups or Leo-pald's revival shenanigans. So Great Nature had a plethora of play styles available in its first real year, a huge amount of support across three consecutive booster sets, and could break the boundary into competitive play if worked on seriously enough. Why didn't more people play it, then? There was once a joke in the Vanguard fandom that we were interested in Rampage of the Beast King when we saw Lox, but we came to the set for Luquier, and then we stayed for Sarah. BT07 as a whole has a bad rep with the fanbase; part of that is marketing, part of it is design flaws, and part of it is the audience. Great Nature was far more cerebral and far less straightforward than something like Gold Paladin or even Neo Nectar, it was pushed as the next big thing without clearly explaining what made it good, and several of the deck types were just too difficult to pull off compared to the crossrides that were still dominating the game at the time. Bushiroad wasn't helping by providing very little direction with the decks and feature episodes. Seriously, the decklists they provided were terrible. Two Binoculus Tiger and one Compass Lion? Tank Mouse tech with four Monoculus? Two perfect guards? Maybe the biggest issue with Great Nature early on was which cards were allocated where. If we had Duckbill in BT07 rather than Flamingo, Leo-pald would have had a much easier time topping against the meta monsters. If Compass Lion had been in there from the start, that would have alleviated the issues felt by Lox cardfighters that were running into situations where they could get their ride chain going but rarely had anything they could use to retire units with. 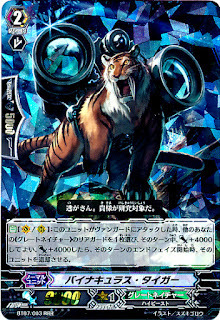 Hammsuke/Ruler Chameleon as your primary advantage engine was a hard sell, and so was getting fighters to track down three copies of Binoculus Tiger at RRR rarity. Bison and Polaris diverisifed the clan signficantly, but prior to that Leo-pald was the only practical build due to the opening Lox ride having a rough 46% chance to go off. The early days of Great Nature were a time when the clan was underused and underappreciated. It boasted some very unique design concepts and possible directions to build a deck in: if you wanted to rack up hand size you went with Leo-pald, if you wanted a flashy finisher you played Lox or Polaris, and if you wanted total resource manipulation you played Bison. In 2018 Great Nature will get a new lease on life, and it's hard to say who the "face" of the clan will be, because they had so many in their first go-around. Just remember--before there was Chatnoir, before there was Bigbelly and Arusha and Afanc, there were three weird little cards named Rue, Apt, and Lox. And they were neat as h*ck.